Heraflux Technologies has just completed our first-ever SQL Cruise training event. The destination for this cruise was three stops in the Caribbean the first week of February this year. David Klee taught two technical sessions on infrastructure and virtualization performance tuning to a packed room of database professionals. What is the SQL Cruise? 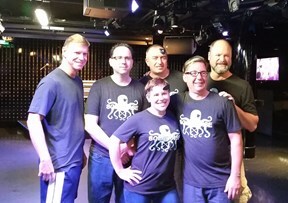 The SQL Cruise is an intense SQL Server training class – on a cruise ship! Eighteen technologists, each of which work with the Microsoft data platforms in different aspects of their jobs, joined five technical leads (Kevin Kline, Grant Fritchey, Jes Borland, Jeff Lehmann, and David Klee) for packed days of technical training while the ship was at sea. While at port and in the evenings, the group networked, relaxed, and brainstormed about numerous topics, both technical and non-technical alike. The training sessions were at least two hours long each, which gives the instructors time to dive into the sessions in ways rarely seen in traditional training classes or conferences. The attendees get the time to treat the sessions like a conversation rather than a lecture, and as a result, the attendees feel comfortable asking any of the questions that normally go unasked in traditional environments. The breadth of topics presented were immense. Topics ranged from execution plans, optimized instances, tuning tools and techniques, backups and restores, automation, and professional development. The best part of the training sessions was intimacy of the training. The lack of the usual distractions kept the sessions focused and intense. Due to the high prices of the Internet connectivity on a cruise ship, attendees were not on-call from employers or constantly checking email. Having the unhindered ability and time to sit and pick the brains of a legendary presenter such as Kevin Kline without the pressure of competing for time is fantastic. Office hours re-enforced the amount of one-on-one time with the presenters and attendees alike to ask any question or talk through current technical challenges people were currently facing. This time is truly unequal in any other training environment. While at port, the group was able to network and see the sights together, relax on the beach or by a pool. It’s a great way to combine training and relaxation! Family and significant others are welcomed to join in on the fun as well. Heraflux feels that the SQL Cruise is one of the best venues for advanced SQL Server training on the planet, and is proud to support the SQL Cruise for this and future events. Check out www.sqlcruise.com for future itineraries.